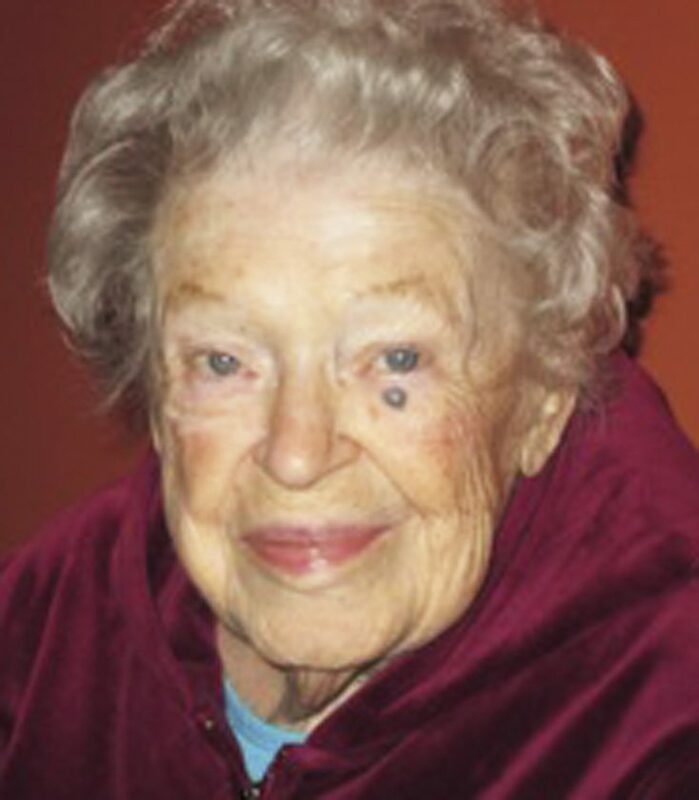 Marjory C. Diehl of Brocton died Monday morning, April 8 at the Chautauqua Nursing and Rehabilitation Center. She was born Marjory Clampitt on August 2, 1920, just as the 19th Amendment, guaranteeing women’s right to vote was signed into law. She was an ardent feminist before the term was in general use and remained so for all of her 98 years. Co-valedictorian of her high school graduating class, at a time when academic honors went only to boys, she ignored the pleas of relatives, school officials and teachers and chose marriage over higher education. Three years before, at the age of 15, she had gone to visit her best friend, Ruth Diehl, and fallen madly in love with Ruth’s middle brother, Dale. The emotion was reciprocal. They married on New Year’s eve in 1939 and walked home to the in-laws house, in a middle state’s blizzard, much like the one forecast for today, making driving impossible for wedding party, florist, organist and guests. The ceremony was possible only because the church was less than a block away and the preacher lived next door. Living in a tiny apartment, literally steps from those same in-laws, they welcomed a daughter, LeeAnne, in 1941. Dale, worked as a page in the Federal Reserve Bank by day, and helped his parents survive the depression by delivering prescriptions from his father’s pharmacy at night. Six months after becoming parents, the attack on Pearl Harbor changed their lives, as it did all Americans. Dale, his brothers, and Marjory’s all left for war and Marjory joined her sister-in-laws, living out the war with Dale’s parents. Babysitting was expert, free and available and she became a slightly softer version of Rosie the Riveter, gluing glider parts for the war effort. When the war ended, two adults, one disillusioned by war; the other, matured by work, had to fall in love again and to negotiate a relationship that would last for almost 60 years. Supported by the GI Bill, the whole family went to college: Dale, for a degree in business, LeeAnne to first grade in the lab school, and Marjory, happily sampling the creative outlets that college life could provide: Dress design, pottery, woodworking, poetry and cooking. They joined a thriving community of nearly penniless, but endlessly optimistic veteran families living in a long row of connected tin housing. Marjory was literally queen of the hill. Almost every woman living under the long tin roof was pregnant. A few toddlers represented infrequent leaves, but only one woman could proudly share a genuine walking, talking child. Mother and child cheerfully accepted star status. 1950, college finished: Dale beginning a real career with the Federal Reserve; new house, small and square on what was then the very outskirts of Kansas City, Missouri, new baby boy, John Evan Diehl. Marjory began to demonstrate her creative skills. She could sew, build, knit, paint or quilt almost anything. Those were the days when major department stores unveiled fabulous window displays linked to famous magazine covers, held lunchtime fashion shows and proudly proclaimed themselves as sophisticated as NYC. Marjory could spend a few minutes studying, an hour shopping, and go home to recreate –sometimes even improve upon — what she had seen. Marjory, her friends in the neighborhood and their children were very likely the best dressed in Kansas City. LeeAnne was clearly the best dressed girl in grade school, an honor she did not appreciate. High school however, was another matter. In 1959, Dale was promoted to Branch Auditor, heading the Oklahoma City office of the Federal Reserve. Marjory continued to blossom in a new suburban home; with daughter in college, and son in public school, she added weddings to her skill set: Designing and making bridal gowns and bridesmaid’s dresses, baking and decorating the wedding cake, handling the church parts of receptions. Active in her small neighborhood church, she was soon famous for decadent church supper desserts, and painted scenery, made costumes and supervised make up for pageants and holidays. Everything suddenly crashed when rheumatoid arthritis struck mercilessly, leaving her beautiful and nimble fingers gnarled, painful and nearly useless and her strong gait reduced to a slow shuffle. Wasting little time on regret, she re-invented herself as a gardener, coaxing lush flowers and adequate vegetables from the red, dry Oklahoma soil. She enrolled in creative writing courses, read good novels and wrote bad ones. Dale died in 1997 and Marjory moved to New York to argue with her daughter. New York’s damp air and fertile soil unleashed her Gabor “Nothing succeeds like excess” soul and she thrilled to surround her very pink house with dozens and dozens of every kind of plant that would thrive in the climate zone. She relished involvement with the Westfield Garden Club. Son John died in Oklahoma City in 2009. As Marjory grew less mobile, she enjoyed birding from her back window with Bingo, her elderly Yorkshire terrier on her lap. Reading became more and more important at home, and later as she moved into care. The staff at Fredonia’s Barker Library and the amazing 2A team at Chautauqua NRC made her pain more bearable. Life was still worth living. In 2012, Marjory reluctantly gave up her driver’s license and her purple Ford, making the world a safer place. By 2019, life no longer satisfied. She faded away, making that place a little less colorful. She is survived by her daughter, LeeAnne Cogdill, who will always be grateful to both nursing staff and librarians. Anyone wishing to contribute, please sponsor a book at The Barker Library in Fredonia, NY. As per Marjory’s wishes, all funeral services will be private. Arrangements have been provided by the MORSE Funeral Home of Brocton, NY. To leave a message of condolence or remembrance for Marjory’s family log on to www.the morsefuneralhome.com.